HABA® is one of our family’s favorite toymakers with award-winning toys that are the perfect way to prevent summer boredom. HABA has a fabulous selection of toys and games and they are currently featuring a great line-up of summer themed toys including offerings such as fun play kitchen foods and accessories, doorway theatres, pretend play toys and more. What I love the best about HABA® toys is that my children consistently want to play with these toys over and over again and it is such a wonderful way to promote their creative expression. My daughter, Hannah loves to role play and make her own forts. 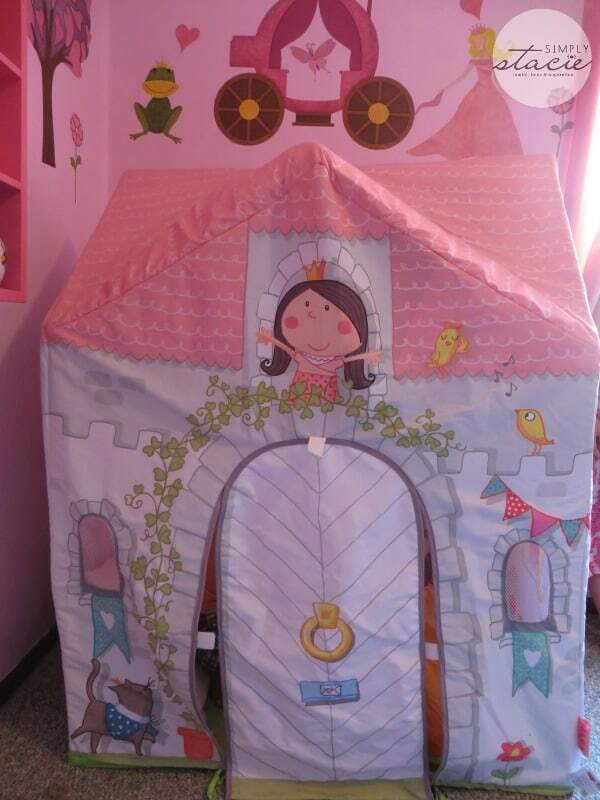 Therefore, I knew that she would love to play in the HABA® Princess Rosalina Play Tent (SRP $90). What I didn’t expect is that it would be so popular that she and her brothers would practically live in this tent. This play tent is so durably made and well-crafted as it is far superior in terms of quality than any of the other brand tents that I have purchased in the past. It is created with a breathable polyester which doesn’t get too hot and the frame is constructed of plastic rods that interconnect so setting it up and taking it down is very easy. In fact, my three children (ages 6, 7 and 9) insisted on putting it together by themselves while I was ready to assist as needed. It is a nice size measuring 35 ½” L by 20 ¾” W by 43 ½” H making it easy to move around from room to room when constructed but not too big that it takes up a lot of extra space. 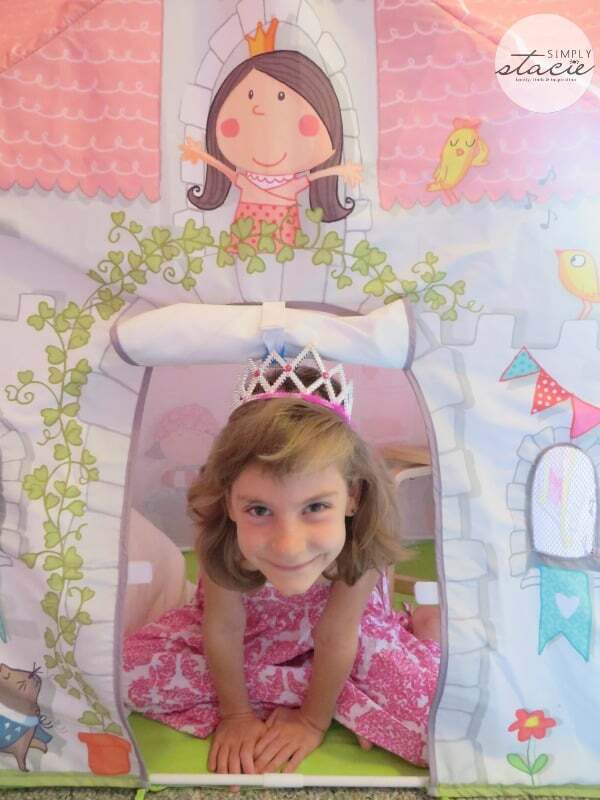 The attention to detail is exceptional as this Princess themed tent has a lovely castle feel to it with whimsical characters and vibrant colors. Hannah loves that she can open and close the door and the window flaps too while pretending she lives in the castle. “Princess” Hannah decided to invite her brothers, “Prince” Adam and the Court Jester, Jacob to play with her and their imaginations just went wild with endlessly fun play ideas. She enjoys playing in it with her brothers and also enjoys the solitude of escaping into it alone when she wants her own personal time to read a book, color or play with her dolls. 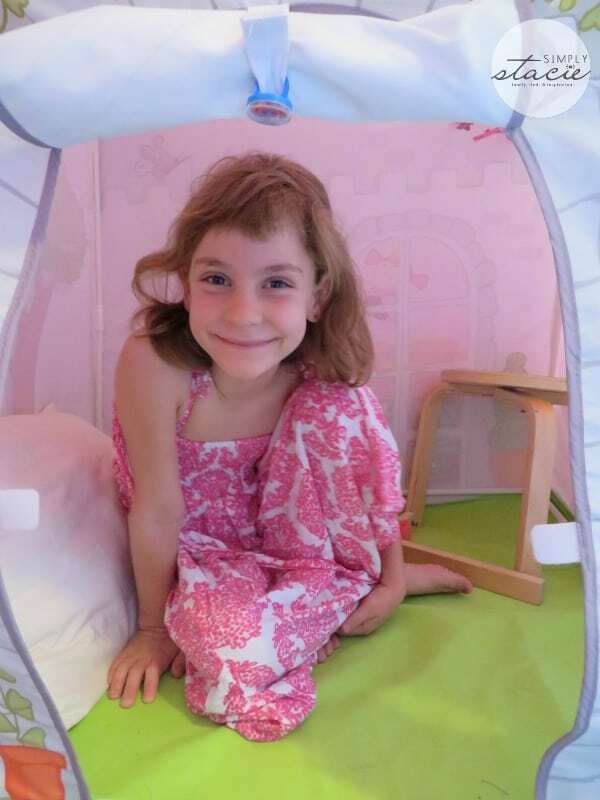 In fact, one night it was so quiet in her room that I went to find her and she had made a little bed and fallen asleep inside her play tent! Hannah and her brothers also love to play together in their pretend kitchen and having the right play foods and accessories is essential to the fun. HABA® has lots of ideas to choose from including an apple pie, hotdog, ketchup & mustard set and more. My kids love their new pretend play hotdog ($10) which is so realistic and it even comes with condiments such as cucumber slices, cheese shreds and roasted onions. 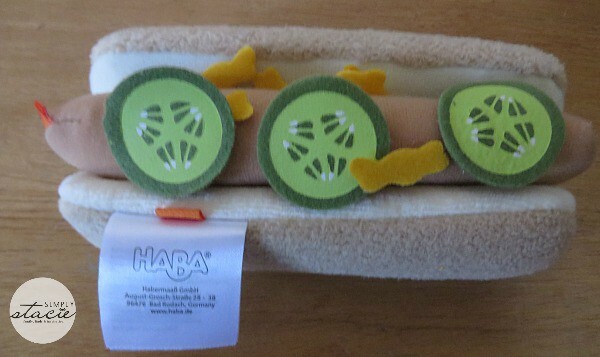 It is made of polyester and felt with the authentic feel of a real bun and hot dog. Recommended for ages 3 and up, this fun example of pretend play food from HABA® has been a great addition to our play kitchen and I can’t wait to add a few more items too. HABA has so many great toy and game ideas for summer fun this season! You are invited to visit HABA to browse the entire collection. If you are looking to avoid the “I’m bored!” declarations this summer then a few new toys from HABA would be the perfect solution! My daughter would love the Land of Flowers bean bag! My kids would love to each have the Terra Kids – Multifunctional Backpack for on our summertime hikes. I love the Pushing Car Walker Wagon. i like the leo the hound playset. I love the play food!! I like the zippy Scooters Domino game for my son and I like the Nelly doll for my daughter. I also like the Pushing Car Walker Wagon. my son would like the Airplane Assembly Kit. I like their 1001 Nights Magnetic Arranging Game and so would my niece. the pushing car walker wagon. I liked the activity apple.